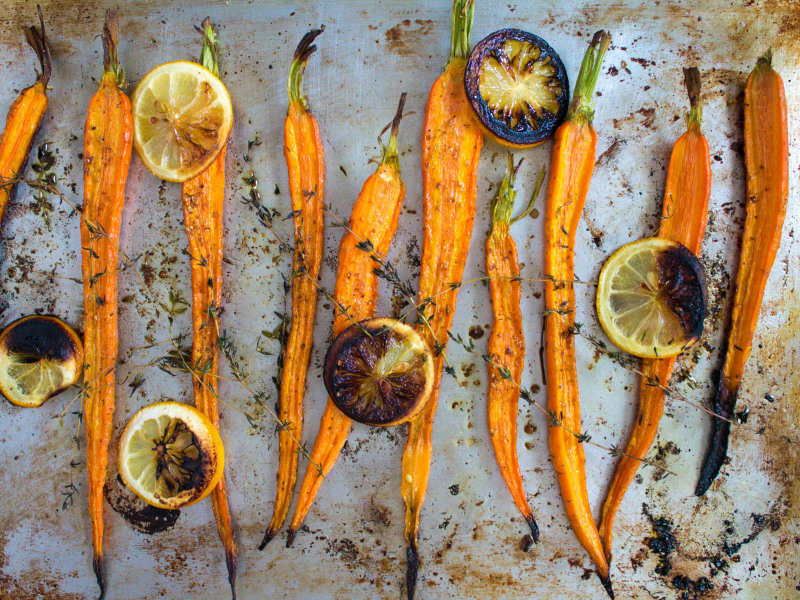 Roasting carrots brings out their natural sweetness. Lemon and thyme contribute bright, fresh flavors for a great side dish any time of year. This preparation also includes the flavorful addition of coriander seeds and cumin seeds into the dish. 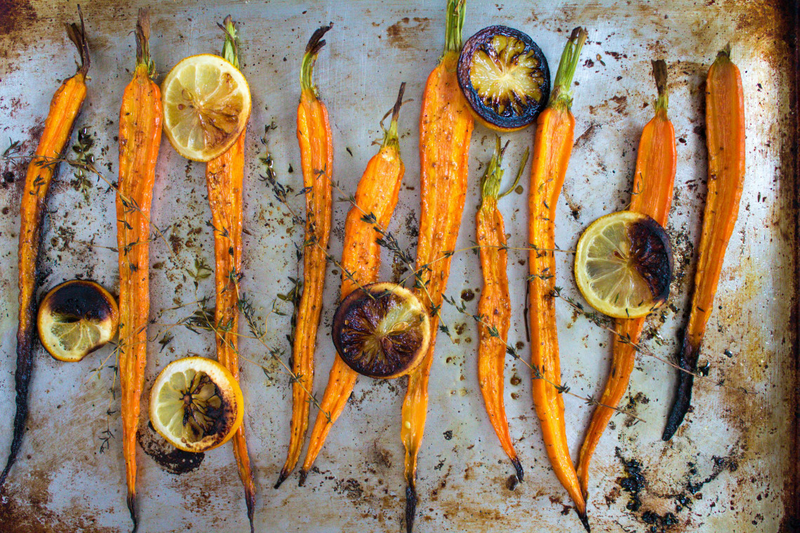 Start by lightly toasting them in a dry skillet until aromatic to release their full flavor potential. This recipe is a great side dish for poultry or pork dishes. Great for those following the Paleo diet! To cut down on prep time, toast and grind the coriander and cumin seeds in advance. In fact, you will love having these seeds on hand for other recipes as well! 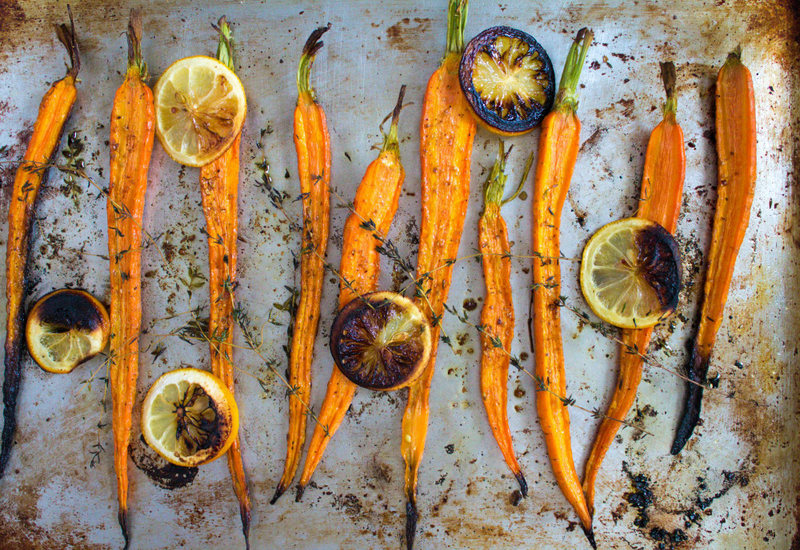 For perfect caramelization, place the carrots cut-side down in the baking pan. You will love the beautiful color that forms on the surface. Per Serving: 42 calories; 4g fat; 3.2g carbohydrates; 0g protein; 0mg cholesterol; 8mg sodium. The toasted coriander and cumin was an awesome compliment to the roasted carrots, I never really cooked with coriander before but I'll definitely be trying it out in more dishes in the future. Tasty little side dish. I love to use coconut oil instead of olive oil because it helps bring out the natural sweetness in the carrots. I took the above recommendation for coconut oil and think it paired really well with the cumin and coriander. I also used the colorful carrots from Trader Joe's for a company Fall potluck, it was a huge hit!! This recipe is so simple, but fantastic! The cilantro in my garden had gone to seed — some of it awhile ago, so those seeds were dried and brown, but other seeds were still green and fresh. I pulled some of both and toasted/crushed as instructed. It was great!